Its surroundings are awash with wildlife and stunning views. If you have searched in vain for a natural escape that is off-the-beaten path, this is it. 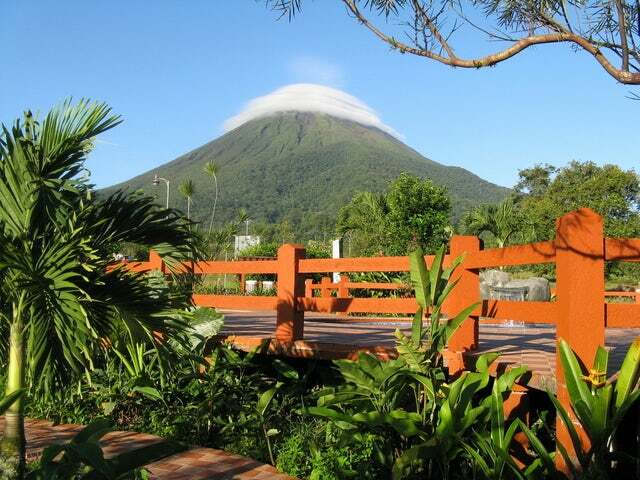 The Lost Iguana Resort & Spa is nestled on 120 acres of primary rainforest in Arenal Volcano National Park, Costa Rica. It is a boutique hotel with 42 well-appointed rooms. Its surroundings are awash with wildlife and stunning views. If you have searched in vain for a natural escape that is off-the-beaten path, this is it. Expect to find the following minimum amenities in the accommodations listed above; a king-size bed or 2 full sized beds, safety deposit box, coffee service, minibar, satellite TV, air conditioning with ceiling fans, a private balcony with spectacular views of the volcano. For your dining needs, you are welcomed to the onsite restaurant - The Blue Hibiscus. It serves all sorts of local delicacies as well as international fare. It is at this restaurant that you get to understand why Costa Rica tops the CNN's list of the happiest nations. Among the most appreciated holiday activities at the resort is visiting the Golden Gecko spa. It is located along a meandering river on a 3 acres piece of land. Inside the spa you will find a gymnasium, saunas, private massage bungalows, internationally trained therapists and the natural music of the wildlife. Imagine being soothed by the sounds of the cascading river or the melodic songs of the exotic birds? Watersports such as kayaking, windsurfing, fishing and boating and many more. Make a reservation today and get to experience the best Costa Rican hospitality and adventure. You can also click here to see what others are saying about the hotel on Trip Advisor.